Seth Own is a college freshman from Jacksonville, Florida who has had one hell of a few years. And his story just got crazier after a trip to Los Angeles to sit on Ellen’s chair. After his dad snooped through his phone and discovered Seth is gay, he was thrown out of the house by his ultra-religious parents. Seth responded with a determination to succeed that would be impressive from any youth, let alone one who’d been made homeless by unaccepting parents. His story of forging ahead through a storm of circumstance remains an inspiration, and Ellen can smell inspiration from a mile away. True to form, she can’t help but offer a major gift to help him on his journey. I swear…..Ellen is the Rosa Parks of Gays and Lesbians. She has done so much good for the LGBT Community and made it known due to her show. My hat is off to her. Thank you, Ellen. Kudos! As for this young man, I wish him well and much success in life. Anyone subjected to unaccepting religious parents AND religion-based conversion therapy who then doesn’t RUN from all religion is a bit of a slow learner. Seth is going to love the numerous busy glory holes at Georgetown University … a definite perk of a Jesuit education. Not to be a bit harsh, but honestly, did his Dad have to snoop through his phone to learn he was gay??? What, is the man blind and deaf and can’t just see the son? This young man has come so far. 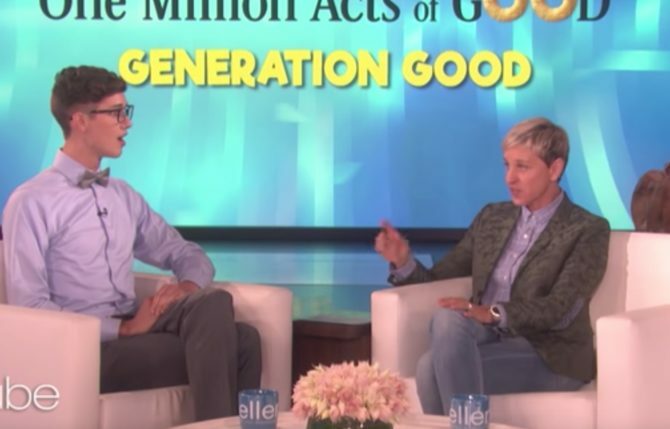 I am so glad that Ellen had him on her show and was able to start his college fund for others. Thank you Ellen. I am an older actor and have seen a lot of young men that are thrown away by their families because they didn’t meet the family standards. Shame on his parents. I hope their religion helps them in their old age as they will not have the closeness of their son even if he remains in their life. This is the sad thing about ultra religious, fundamentalist and Evangelical Christians. Seth is not unique. Many “Christian” parents kick their gay children out of the house, some as young as 12 and 13. I’m glad Seth is doing so well!